I associate the word of “the USA” with the city of New York symbolized by the Stature of Liberty. However, every American doesn’t always have been to the metropolis. How about my old pal in New Mexico? You don’t have any chance to visit it and are afraid of going there a little. Don’t misunderstand please, I don’t mean I chaff people in New Mexico. It is because I have never been to London, Paris, and New York. I am a countryman and was overwhelmed by a domestic tour to Tokyo. I first visited the capital when I was a junior school boy about 30 years ago. The huge scale took me by great surprise. The airports of Narita or Haneda are the gateways to Tokyo for overseas visitors. On the other hand, many Japanese start their Tokyo tours from this Tokyo Station. The first impression that I got off the Shinkansen was that it was not so much as a station but a huge creature. Numerous trains arrived and departed in an endless stream. Uncountable people move around. I could not grasp how many train tracks the station had. At the first place, a station in my hometown has only three tracks. In the first place, the comparison may be non-sense. For this very reason, the mammoth Tokyo Station itself can be an attractive and recommendable sightseeing spot. How tiny this station in my hometown is! It cannot compete with Tokyo Station at all. The total area of Tokyo Station is equal to about three baseball stadiums. The left end is the Imperial Palace. Originally government-owned but now a private giant, Japan Railways Group known as JR Group is the most large-scaled railway company in Japan which manages Tokyo Station. It is now the hub of JR trains. Trains for Tokyo Station are called “up-trains” and trains traveling away from the station are called “down-trains”. Today, many buildings side by side in front of the Imperial Palace, but there was a large open space a hundred years ago. Tokyo Station was built there. The station which is the nearest to the Palace is the center of railways in both name and reality. The symbol of Tokyo Station is the red-brick building whose length is about 335 meters (about 1,100 feet). It is 2-meter longer than the height of the Tokyo Tower. There are 15 platforms and 30 tracks including underground portion. It seems a mighty fortress or massive battleship and has 3 stories above the ground and 5 underground stories. More surprisingly, about 400,000 passengers a day get on the trains at this station. That is why railroad buffs can take photos of various types of trains there. This station building was first completed in 1914. The one hundredth anniversary in 2014 marks full-scale restoration such as parts destroyed in the Second World War in reference to documents and written materials at the day. The characteristic domes was not restored yet. The weather beaten brick building was completely renewed and restored in time with a century anniversary. Without diminishing an original building, the latest earthquake countermeasures were introduced. The part of the third story destroyed by an air raid was restored. In particular, two domes which had been once the symbol of Tokyo Station were reconstructed as what used to be. The most difficult part was the interior and ornaments of the domes. In the reference to few drawing sheets and photos, many technical experts collected each and every materials and made the reconstruction possible. To retrofit the building against big earthquakes, seismic isolation rubbers (Red marks of the Image 8) were inserted between the upper structure and the basement foundation by jacking up posts. I wonder that this is unbelievable technology. Would anyone “renovate” me, a guy in my 40s, into 18 year-old boy? After 1905 had seen the end of the Japanese-Russo War that Japan won, national prestige was most boosted in Japanese history. In the elevated social atmosphere, the plan to construct Tokyo Station started. People at that time expected that the station would be a symbol of the capital and be equal to any stations in the world. Various designs were considered for adoption. The final choice was a design by an architect named “Kingo Tatsuno”. He worked on all kinds of buildings and plans whose representative work is the Bank of Japan’s main building. His distinctive characteristics of architecture are robustness. Japan is prone to earthquakes. To secure earthquake-absorbing structure, he drove long 10,000 wooden stakes under the building. As nine years had passed after the establishment, a great earthquake proved the station to be really robust. The Station is a Witness. On September 1, 1923, Tokyo was hit by a massive 7.9 magnitude earthquake. The unprecedented great earthquake resulted in the staggering death toll rising to over 100,000 people. Over 300,000 buildings and houses collapsed or burned out. (Today, September 1 is designated as the National Disaster Prevention Day.) As buildings of brick and stone were destroyed, many people were crushed to death. Even government’s buildings including the Finance Ministry were burned down. In spite of such natural disaster, Tokyo Station was not damaged at all. Building technique by architect Tatsuno was confirmed. 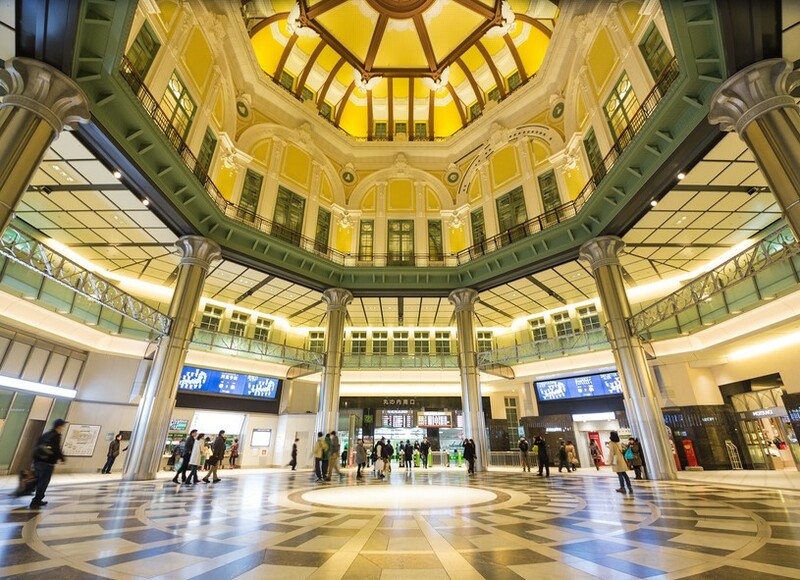 As a central station of the capital, Tokyo Station has witnessed all kinds of historic events. In 1921, a prime minister was assassinated there. In 1930, another prime minister was shot and next year he passed away due to its injury. Stations are the stages of meeting and parting dramas. During this century, how many stories has Tokyo Station seen and how many memories does it remember? Renovation parts are not just for the building facade. The Tokyo Station Hotel whose started business in 1915 is also newly face-lifted as a luxury hotel. The most expensive and splendor room is a royal suite whose accommodation rate per night is \800,000 (About $8.000). It is very difficult for ordinary travelers to stay at the room, so minimum price rooms of at least $300 per night are available. From the rooms facing the Imperial Palace side, you have views of central group of buildings in Tokyo and a beautiful urban sunset. From the opposite rooms, you look down hustle and bustle of the station inside under the magnificent dome from your room’s window. I am sure you would feel as if you were a prince or princess. Furthermore, there are several food malls whose uncountable restaurants are not only authentic Japanese food, Western style food, Chinese food, and other ethnic cuisines but also a mall specializing in many ramen shops. Other interesting shop sell 170 local box lunches all over Japan. It is no longer necessary for you to visit other areas to enjoy local cuisine! For rich retired people, how about staying at the hotel about a month, enjoy various cuisines, and go for a walk around the Imperial Palace! The west side of Tokyo Station is called “Marunouch” Entrance and the east “Yaesu” Entrance. The word Yaesu was not originally Japanese language. It was named after a Dutch sailor, Jan Joosten van Lodensteijn who drifted down to Japan in 1600. The pronunciation “Jan Joosten” was gradually changed into Yaesu. He received the confidence of the Shogun at the time and became a diplomatic advisor. After serving the most powerful person, he was given his homestead. (The Imperial palace used to be the castle of Tokugawa Shogunate government. After the Meiji Restoration, however, the capital of Japan relocated from Kyoto to Tokyo. Then the castle became the Imperial Palace of a Japanese emperor.) Somewhere down the line, the area came to be called “Yaesu”. After 400 years passed, Jan Joosten left his name in Tokyo. I wonder if what deep emotion comes and goes in his mind. In the explanation of building renovation technology.